Be the first to share your favorite memory, photo or story of Gerald (Jerry). This memorial page is dedicated for family, friends and future generations to celebrate the life of their loved one. Gerald (Jerry) Hickman, 88, of Midland, died gently and peacefully on November 2, 2018, knowing he was loved. Jerry was born in Lansing Michigan to Bruce and Minnie Hickman. He moved with his family to Midland Michigan at age 14 where he graduated from Midland High School. Jerry became a Journeyman Electrician at the age of 21. He enjoyed his career as shop supervisor and Electrical Systems Designer at Dow Corning. Jerry loved folk music and traditional dancing. He organized the Midland Traditional Dancers and taught contra dancing and clogging at the Midland Community Center. He also taught dance to Midland students and Girl Scouts, and he was the Dancing Master at the Historical Society’s Victorian Ball. 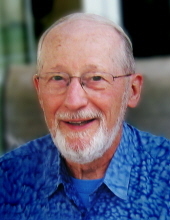 He was a faithful member of Trinity Lutheran Church, a friend of the Unitarian Universalist Fellowship, and he was an active member of the Folk Music Society. Jerry’s bright spirit and enthusiasm for life touched the lives of all who knew him. Jerry is survived by his loving wife and favorite dance partner for 34 years, Marlene Schneider Hickman. Also surviving are his beloved daughters Sharron (John) Cox and Ann (John) LaVier; 7 grandchildren: Danielle (Jason) DeMoss, Desiree (Jonathon) Sandoval, Denise (Evan) DeHerra, David (Heather) Cox, Erin (Ramon) Bonzon, Christopher Kinnun, and Sean Kinnun; 9 great grandchildren, and 2 great-great grandchildren. Jerry is also survived by his step children: Lisa Van Dell Torkildsen and Robert Scott (Carrie) Van Dell, 5 step grandchildren and 1 step great grandchild, his brother Victor Hickman, his sisters-in-law Margaret Cowan and Ellen Schneider, and by the mother of his children, Barbara Whisler. He was predeceased by his son Dennis Hickman. A celebration of Jerry’s life will be held on Saturday, November 10, 2018, at 11 AM at the Trinity Lutheran Church. Jerry’s family will receive friends on Friday November 9, from 6-8 PM at Ware-Smith Woolever Funeral Home and at the church on Saturday from 10 a.m. until time of service. His family is grateful for all the compassionate care and attention he received in the last months of his life. Donations in memory of Gerald Hickman would be appreciated to the Toni & Trish House or Senior Services. To plant a tree in memory of Gerald (Jerry) Hickman, please visit our Tribute Store. "Email Address" would like to share the life celebration of Gerald (Jerry) Hickman. Click on the "link" to go to share a favorite memory or leave a condolence message for the family.